If you ever went to Monroe Elementary or Monroe High School in Monroe, IA during the 1970s or 80s than you know all about this brown bread. This bread’s coloring and sweetness comes from molasses. 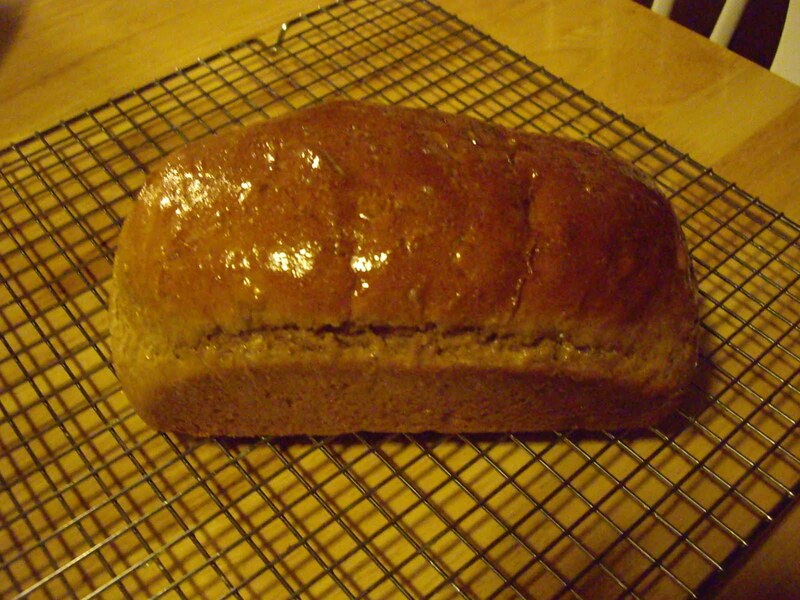 It is light and fluffy with a glaze that is brushed on soon after taking out of the oven. Makes 3 loaves in 8″x4″ loaf pans. In a large bowl, dissolve the yeast in 1/2 of the warm water. Add the rest of the liquid, molasses, shortening, eggs, salt, and oatmeal. Add flour a few cups at a time, stirring well after each addition. When you can’t stir anymore with a spoon, switch to your hands and mix well. Knead until you have a soft dough that stays together, adding flour if needed. Put dough back into the bowl and cover with a towel or plastic wrap. Divide into three and put in loaf pans. During the second rising preheat the oven to 350 degrees Fahrenheit. Bake approximately 30 minutes until bread seems done. Use the thump test. Mix glaze ingredients together in a small bowl. Brush glaze over the hot bread. Remove from pans to cooling rack.